Some appliances get put to use every day, and as such, are usually just left out on the counter. It’s nice to always have your most often used tools easily at your disposal, but when not in use, these popular appliances have a tendency to get in the way. 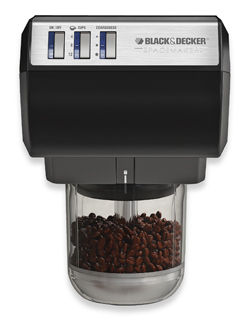 The Black and Decker Spacemaker Stainless Steel Chopper/Grinder solves this problem by mounting under a cabinet. With interchangeable blades and containers, the device can be used as mini-food processor or coffee grinder. There is pulse control for chopping, along with a grind selection button for choosing between fine, medium and coarse. Measuring less than ten inches across, with a height of about 5.5 inches, the Spacemaker not only frees up valuable counter space, but also allows for the ability to accomplish everyday tasks with one convenient unit.